It’s flu shot season. The mainstream media is now fully engaged in a furious flu shot marketing campaign. However, while many are taking a pass on the shot that’s consistently failed to live up to the hype, others are learning of a dark consequence to taking the shot. Yep, and now the mainstream media is begrudgingly reporting on the matter. The flu shot can result in a painful arm condition called shoulder bursitis. And it hurts. Just ask Memphis resident Leslie Moon, who Memphis’s Fox affiliate interviewed after she suffered the painful flu shot injury. “So thankful it’s my left arm, because I’m right-handed and all of my primary art is done with my right hand,” she told FOX13’s sister station in Seattle, KIRO-TV. “I just pulled down my shirt, a little bit off the shoulder…and I remember he was standing so it was very rushed,” Moon explained. Moon tried chiropractors, massage therapy, and trips to her doctor. But it all failed. Moon is now left holding the bag with a painful arm condition. 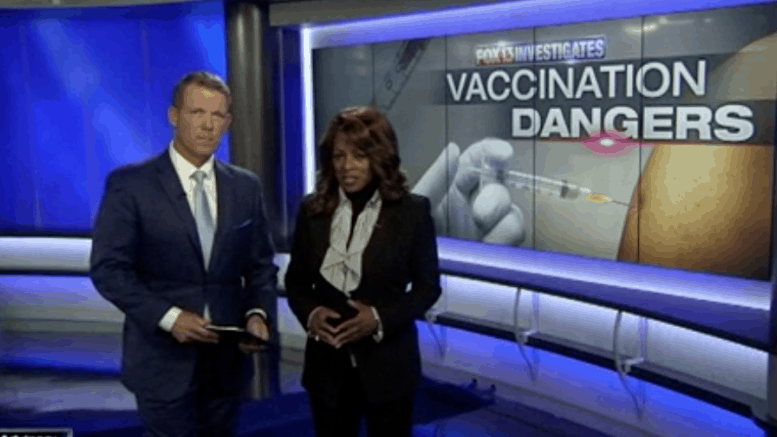 And KIRO-TV didn’t pull any punches in its reporting on the matter, citing “vaccine injury” as the issue. In this day and age, such a phrase is often considered blasphemy. Vaccine injuries are more common that many people know. So much so that the government even has a special program that pays out millions of dollars each year to compensate victims. “Shoulder injury related to vaccine administration” – known as SIRVA – is when any kind of vaccine is improperly injected into the shoulder joint or bursa. Moon now gets cortisone injections which she says is helping to ease the symptoms and pain of bursitis. While Moon doesn’t state her position on future flu shot opportunities, she does confirm she has legal representation for her current situation. For Fox News, this isn’t their first time to cause a flu shot stir. Back in January, Fox and Friends co-host, Brian Kilmeade, discussed his aversion to the flu shot. Beyond that, WJXT’s Jacksonville news anchor Nikki Kimbleton posted harsh pictures of her flu shot side effect last month. For clarification, WJXT is an independently owned media outlet and unrelated to Fox News. Also last month, CBS’s Minneapolis affiliate, WCCO, covered the story of a local woman’s flu shot shoulder injury. The facts are becoming more and more difficult to ignore, even for biased news outlets.